A Wonderful Betta Club In Hartford, Connecticut! Proud Chapter of The International Betta Congress. Imagine the Possibilites...Expand your Horizons....Open your Mind...Then, Dare to Dream Larger than Life...For Only You, can make your Dreams Come True! 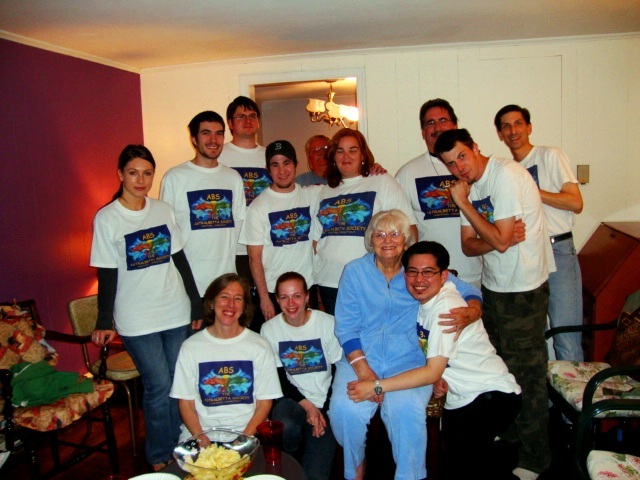 Located in Hartford, Connecticut, we have many active members who meet every 3rd Sunday evening to share their love of bettas and have a blast! 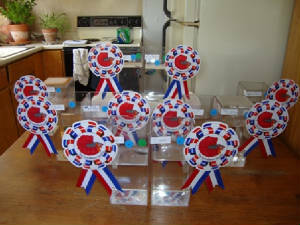 The Winners Table at the ABS Fall International Show 2010! The AstralBetta Society Merchandise Store! *Please Note: All revenue generated from the AstralBetta Society Merchandise Store Goes Directly To Our Club Fund For Our Future Shows & To Funding Our Club Functions! ABS Thanks You For Your Generous Support! 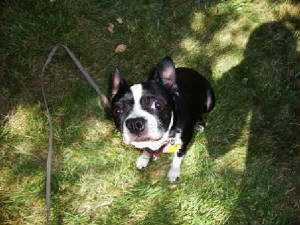 Beatiful Marble HM Male owned and bred by Karen Mac Auley! Webmaster Michael Randall & Former ABS President, Jamie Lee, re-bag the show fish to go home! If ever a fish has given spirit to the imagination, amazed its beholders, thrilled its audience, and surpassed all other fishes in popularity, it is the Siamese Fighting Fish, Betta splendens. There is little doubt that today’s wide fascination with the fishkeeping hobby has been added and advanced by this most unique of tropical fishes. The betta can live comfortably in only enough water to cover it. The betta’s brother is apparently his worst enemy. His colors are those of the rainbow. He builds a nest to harbor his offspring and gives them vigilant care. 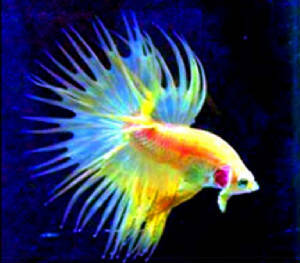 And yet, the comparison with other species, the betta’s needs are little, his resistance to illness great. In fact, everything about him is pleasantly gratifying. Bettas also are known to inhabit the shallow rice patties in Asia. These rice patties are very shallow, muddy waters, not our ideal habitat for a fish. This is where their hardiness resulted from. They use a special organ called the labyrinth to enable them to breathe oxygen straight from the surface of the water. If they did not have this ability, they would not be able to survive in their natural habitat due to the low oxygen levels. The males, as well as females, are very aggressive and territorial fish. If you put a male in another males eyesight, it will result in a display of fins and color to intimidate the other male. 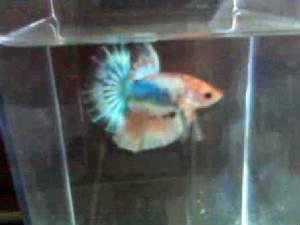 The bettas used in Siam to fight were the traditional wild type betta. That is where the term, "Siamese Fighting Fish", came from. We now only breed to share their beauty with the world and hopefully, put an end to the fighting and mistreatment of this remarkable fish! As you navigate your way around the site, please take notice of the wonderful photos taken by our fantastic friends in Thailand! They are the masters at capturing this marvelous fish at its best! Also, please feel free to leave the club your feedback on our comment card below or in our guest book! We welcome all betta lovers and all of their wonderful stories! Please enjoy yourself! *Information taken from Chok Pengit of Siams Best Bettas. The Best Of AquaBid Video! Some Of The Best Fish Sold On AquaBid! International Betta Congress is the governing body of the Betta world. It exists to help educate and watch over the world that is Betta Splendens. Joining the IBC (International Betta Congress) puts you in touch with the worlds leading Betta people from the areas of breeding, genetics and showing. With the many chapters or satallites of the IBC, we are sure a Betta club exists in a town or city near you! Please consider joining the IBC...Share your love of Bettas with the World! Please take a moment to tell us what you think of our site, or about yourself and your bettas, products or services you have to offer for our Betta Shop. Thank you! *Notice To ABS Members-We will begin creating your personal Betta Pages on the site or sponsored by the site. 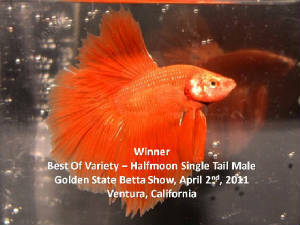 Please send photos of your bettas, information about you and so on to webmaster. Thanks so much! ABS & IBC Event Calender-Domestic Only! *See IBC website for more details.